Karenia brevis made an unwelcome appearance this weekend on Florida's west coast. K. brevis - or as you may know it, the "red tide" - has been largely absent for the last few years. The readings were low to moderate. 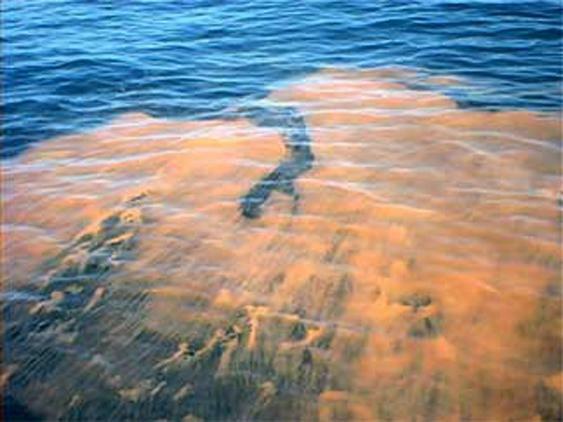 NOAA defines the red tide as a "harmful algae bloom" of k. brevis, though other algae can contribute to a red tide as well.It's difficult to determine what factors influence a red tide: is it lack of predation? Water salinity? Is there a permanent bank of k. brevis somewhere off the coast that washes toward land?Not all algae is harmful, but k. brevis can be toxic to marine life, and to the local economy: the FWC estimates that the impact of a red tide in the 1970's was $15-$20 million.The FWC notes that controlling a red tide is difficult. Not only must the organism be killed, but the lasting toxins in the water must be dealt with. Researchers have found ways to control shellfish toxicity but a comprehensive response to red tides has not yet been discovered. The FWC notes that the area between Tampa Bay and Sanibel as being high-risk for a k.brevis algae bloom.The FWRI Red Tide Status Line is now available to callers throughout the state. FWRI updates the recording each Friday by 5 p.m.Red Tide Status Line:Toll-free, inside Florida: 866-300-9399Outside Florida: 727-552-2448Recent reports can be accessed on the FWC web site.